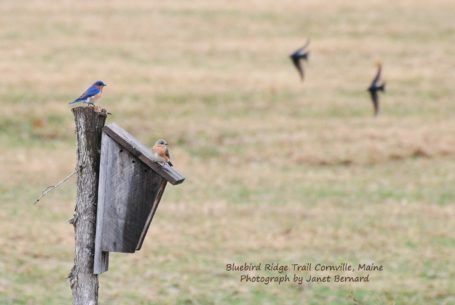 With my husband's help, I have been maintaining and monitoring a bluebird trail on our property for over 20 years. We currently have over 30 nest boxes that provide nesting sights for chickadees, swallows, bluebirds and house wrens. Each spring we anticipate the arrival of spring on the wings of our fine feathered friends. In this photo a pair of Eastern Bluebirds appear to have chosen their sight as a pair of Tree Swallows flutter about in the background.